Removable dentures can be affixed with at least (if necessary, four) implants. The denture can be simply snapped onto the implants (that are shaped especially for this purpose). As conventional dental prostheses cannot be affixed with implants, a new denture must be prepared. There is no need to replace the implants frequently because their life-span may reach 30-40 years. Dentures affixed with implants are more comfortable, convenient and aesthetic than conventional removable dentures. Unlike conventional dentures, those affixed with implants will not loosen or move, which greatly improves the patient’s quality of life (no limitation of everyday activities; no embarrassing problems when speaking, eating, or laughing). Fixed dentures do not irritate the gums and, consequently, do not cause gingivitis. No need for adhesives; the removable denture is simply snapped onto the implant heads. Easier cleaning: removable dentures affixed with implants do not move, so they can be worn when sleeping; and they can be cleaned with a special toothbrush, without removing them from the mouth. 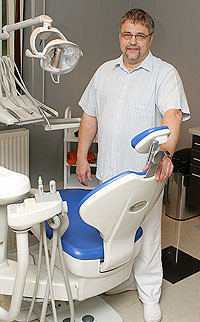 The implants do not need to be replaced; they may last a lifetime with proper oral hygiene and regular check-ups. Chewing just like with natural teeth; consequently, no more digestion issues. You can eat any food, even those that you could not chew with conventional dentures. As an upper denture affixed with an implant does not fully cover your palate, you can taste all foods naturally. As a denture affixed with implants does not move, it does not distort your speech. The implants behave just like natural tooth roots; consequently, they not only prevent further bone loss but also stimulate bone growth. Bone loss is inevitable with conventional removable dentures, which significantly lowers the stability of those dentures. If your natural teeth have long been lost, jaw bone quantity may be insufficient for implantation. In this case, bone grafting is needed. The procedure can be performed together with implantation if the bone deficiency is minor; otherwise, bone grafting is performed first, followed by a six-month healing period before implantation.